Just a quick note: I discovered this series of music/interviews/documentary on the Jesus Music of the 70s (created as a 25th anniversary in the late 90s) to be available on Amazon Prime. 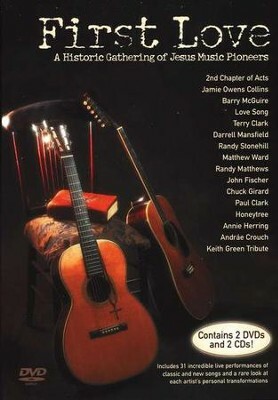 The collection includes a combination of P&W standards and Jesus Music performances. The P&W songs covered include Keith Green's "O Lord You're Beautiful" and "There Is a Redeemer", 2nd Chapter of Acts' "Easter Song", and Andrae Crouch's "Bless the Lord O My Soul." If this is all new to you, you owe it to yourself to hear from these landmark pioneers as to how Jesus Music was trailblazing in its day, and where it began to morph into a multi-million dollar industry. A local Calvary Chapel hosted Honeytree, Nancy Henigbaum, over the winter. She had a couple of copies of First Love available, and I scooped one up. If you want to hear and see where we came from as contemporary worshipers, get this collection. Somewhere along the lines, things changed, and I fear for young people who only hear the current "pop 40" music available exclusively here in the Northeast.